I'm sure you know by now I will take every holiday/occasion and turn it into a little photo theme and feature my animals. 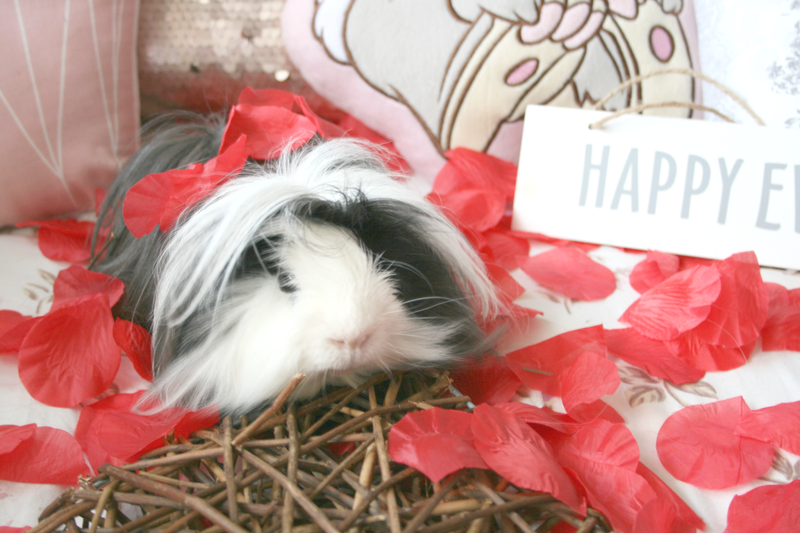 So tomorrow is Valentines and so I decided to share Sheldon's photos with you today! Aurora did not want to take part in this whatsoever so she'll be missing this one! Photographing animals is not easy because in reality I took 60 photos of Sheldon and only these 3 turned out okay. Instead of just leaving this post as a picture post I decided to do a 10 facts about Sheldon that I've learned over the time of bringing him up. Sheldon's favourite past time is sleeping. Honestly though, if he's not eating he's sleeping. He yawns every 5 minutes and just chills all day everyday. Yes I will say he's very much like me, I appreciate sleep, who doesn't love sleep!? But Sheldon is just beyond lazy. But that's okay! He's recently discovered that Aurora is a girl. Take that as it is. Basically I have to pull him off her sometimes. However he's been very good lately and is keeping his distance when she comes near him. Sheldon recently turned 2! Which is slightly crazy because I feel like I only got him yesterday. 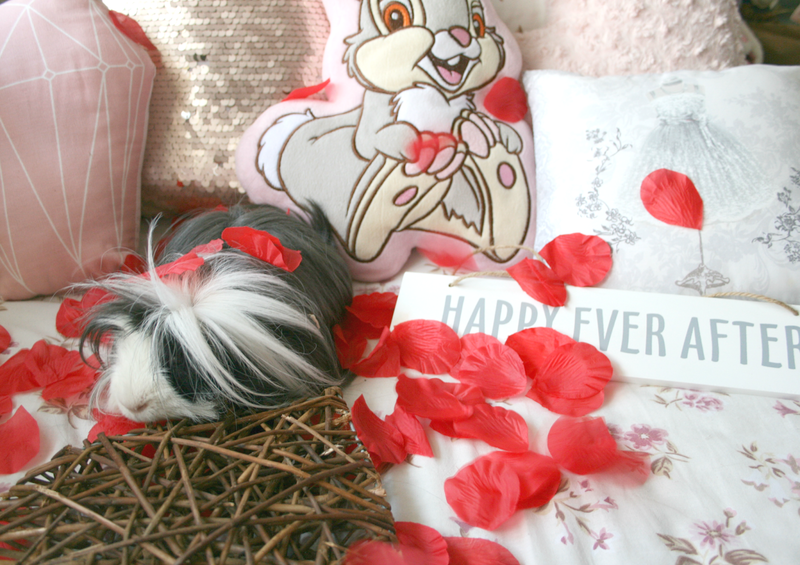 Of course I did a blog post all about the day and showed you his gifts he un-wrapped! Catch up on that post here! His all time favourite food is Cucumber. He likes Carrots, Broccoli, Lettuce, Tomatoes basically most things you name but nothing seems to come close to Cucumber. No matter where he is in the house if he hears the kitchen door or fridge door close you can expect your ear drums to burst from his loud whistling. When Sheldon was younger his fur was black and white, however his body has now turned silver leaving only the fur on his face jet black. His messy hair though continuously makes me laugh at how punk rocker he always looks! Sheldon has a major attitude. One minute he could be rumbling at you rubbing him and the next minute your finger could be bleeding. He doesn't like cuddles at all, hates it when you move his blanket in any way and did I mention you can only rub him for as long as he wants you too? He constantly gives out if you're holding him no matter what, he's just very...well moody! His favourite song is "Yeah" by Usher. You're probably thinking what a weird statement but it's true. Whenever this song is played on the radio or tv etc he will rumble throughout the verses. It's pretty darn adorable if I must say however when I try to get it on camera it's like he knows and immediately stops. So you may just take my word for it for now! When I talk to him or call his name he rumbles and waddles his little bum. He won't do it for anyone else in the house only me and it's the most adorable thing in the world. When he was younger he honestly thought his name was "little boy" because that's what I'd call him. I had to cut down on that so he'd realise his actual name. But everything is good now and he will waddle him bum at me for either name. I've thought Sheldon to do tricks for a treat. He's a Guinea Pig so he can't do a backflip or anything crazy but he can do a circle, stand on his two back legs, stand up on you and give you a kiss all on command. Aww he is the cutest. I bet Aurora is loving him getting a bit frisky with her! haha. Sheldon sounds like a pretty cool a guinea pig. I mean, loving Usher AND looking like a punk rocker? I'd love to be his friend. And I also feel you on the photographing animal part; their constant movement is such a dilemma to deal with, haha. These are pretty pictures, nonetheless! Oh my god he is so cute! I love him! 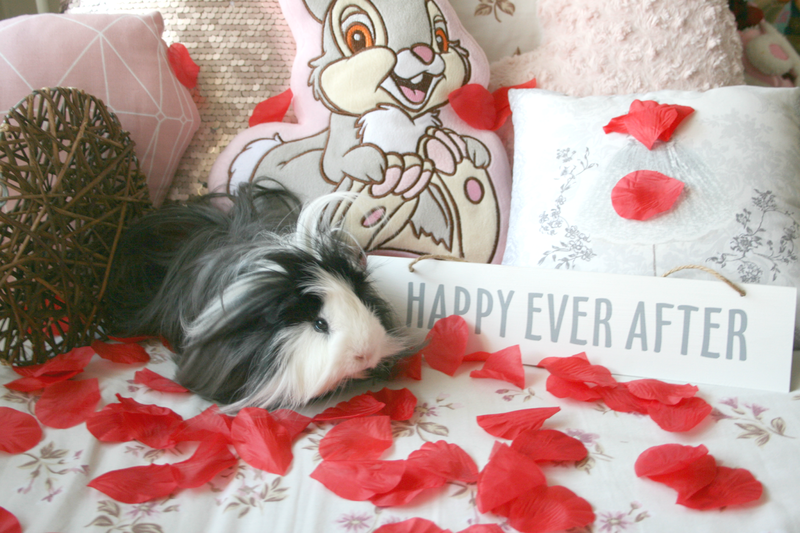 I would love a guinea pig so much! I have two hamsters, Harry and Ron they are so cute!! OMG. That is the cutest guinea pig I've ever seen - such a little fluff ball!